2019 DC/Marvel Cartoon Series Tournament - Who Won It All? Welcome to the results of the 11th Annual CSBG DC/Marvel Character Tournament! This year, you votedg for your favorite DC or Marvel superhero cartoon series. The selection committee this year (with one small exception) was the IMDB user reviews (subject to a minimum amount of votes cast, so the ultra-new DC Super Hero Girls cartoon wasn't eligible just yet). I let the IMDB.com user reviews deliver the seeding for #1-64, with the major exception being Teen Titans Go. The IMDB.com user reviews haaaaaaaaaaate that show for whatever reason, but since I am not about to have a show that was popular enough to gets its own hit movie seeded as a #16 seed in the first round, I split the baby there a little and gave Teen Titans Go a #5 seed. Otherwise, the shows were all ranked by user reviews. I figured that that might lead to some upsets based on the user reviews not reflecting what CBR readers believed. Well, as it turned out, IMDB users and CBR readers had some pretty darn good overlap, as the favorites succeeded in a way that I've never really seen before in one of these tournaments. Usually there are a couple of upsets early on but then towards the end, there's at least a #2 seed or a #3 seed making it to the Final Four. Not this time, though, as the Final Four were all the four #1 seeds. You can click here to embiggen the image. 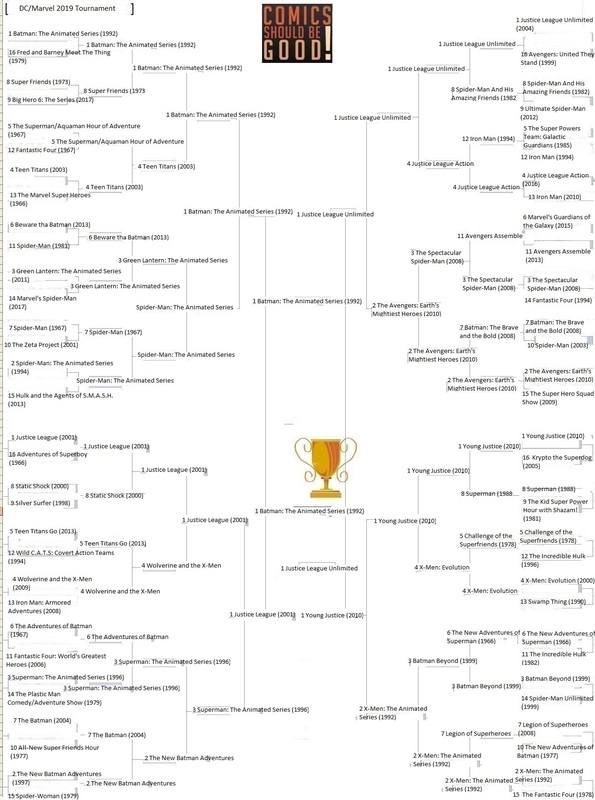 It's kind of funny that we're 11 years into this thing and I still can't find a better bracket template than this one, but, well, sadly that is the case. Anyhow, let's see how it all went down in the finals! With 2,595 votes cast, Batman: The Animated Series took down Justice League Unlimited 62% to 38%. But dang, Batman, you don't have to be all cocky about it! Act like you've been here before! Anyhow, thanks to everyone for voting! Next year might be another one of those "Who would win a fight?" ones, as those tend to be a bit more unpredictable. Or maybe I'll do movies again!